Family recipes from the members of GIG of ECW. This is a recipe from my Mom. Beat butter until creamy. Stir in honey. Add flour, salt, vanilla and nuts and mix thoroughly. Form into balls the size of walnuts. Place 2 inches apart on greased baking sheets. Bake @ 300 approximately 35 min, or until light brown. Roll in confectioners sugar while hot and again after they’ve cooled. Can scoop the dough with a spoon, or bag it and pipe it onto the cookie sheet. Dip the bottom of a glass in sugar and press the cookie down. Bake at 325 13-14 min. 2 teaspoons (or more!) of Grand Marnier...Brandy works nicely too in a pinch! Chop cranberries in a food processor. Remove. Chop apples in food processor. Add to cranberries and then add remaining ingredients. Stir well and enjoy. This tastes better if it is refrigerated overnight. This relish can be refrigerated up to 2 months! Often I will make a double batch at Thanksgiving and eat until New Years! Combine in a large mixer bowl. Mix at low speed until a dough forms. 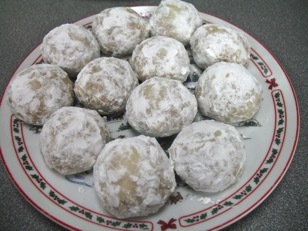 Shape dough into balls using a rounded teaspoonful of dough. Roll balls in additional sugar. Place on ungreased cookie sheet. Bake at 375 for 10-12 minutes, until golden brown. Remove from oven. 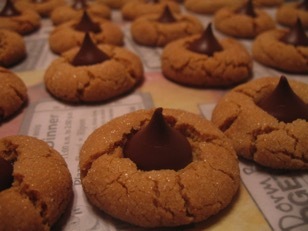 Top each hot cookie with a Hershey's Kiss – pressing down so cookie cracks around the edge. Cream shortening and sugar until very fluffy. Add egg, vanilla extract, milk, and food coloring (optional], beating until integrated. Add the dry ingredients last, mixing until evenly blended. Form the dough into a ball and wrap tightly with plastic wrap. Refrigerate or freeze until cold and no longer sticky, at least 2 hours. Preheat oven to 375ºF (static) or 350ºF (convection). Lightly flour the rolling surface, rolling pin and cookie cutters with Jules Gluten Free All Purpose Flour. Roll the dough to approximately 1/8-inch thickness and cut shapes, re-rolling dough to utilize all the dough. Place cut-out cookies onto a parchment-lined cookie sheet and decorate with colored sugar or sprinkles, if desired. Bake approximately 8–10 minutes, but remove before they begin to brown at the edges. When baked and cooled, frost with Easy Cookie Icing, if desired. Combine frosting ingredients in mixer bowl. If frosting is too dry or stiff – add small amount of milk until it's easily spreadable. 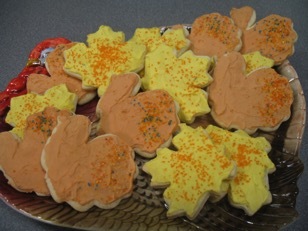 Note: Peg made two different versions of these cookies. One batch following Jule's recipe, another batch using real Wisconsin butter – just like Happy Cows intended. During the group's blind taste-test - butter was the winner!